Back in January we were dealing with record high runoff in Southeast Wisconsin. With that said, all our snow melted before February arrived. Therefore, currently our rivers are low and clear and there’s no snow on the ground. In order for steelhead to be spread throughout our systems we have to hope for rain. We have a lot of fish staging in the lower section of our rivers. A burst of rain will bring them in our upper river system. If we get a shot rain there will be steelhead spread throughout our river systems from Milwaukee to the Illinois border. That means we’ll find them in our harbors and many miles up the river. We’ve been catching plenty of steelhead in the lower sections of our rivers, but the bite has been slow in the upper sections. This will change when precipitation arrives. I’m expecting February and March to be fantastic as long as we get some high water in the next few weeks. High water is a good thing for us. 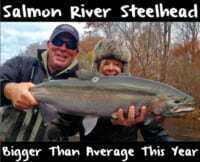 Even if we get blown out a couple of days it will bring many steelhead into our rivers. We haven’t seen a lot of large steelhead this season. However, there’s plenty of five-to-seven-pound fish around. I’m seeing a fair number of good browns, too. For the next few months I’ll be fishing BorX O Fire cured spawn bags and shrimp. The Natural BorX O Fire has been best for the sacks, whereas Orange and Pink BorX O Fire has been the mainstay for shrimp. I’m using about 15-20 eggs per sack, which is larger than most would use. I do this because I get more of an aggressive strike on the larger sacks. For the shrimp I use a piece about the size of a nickel. We use both baits and see what the fish want most that day. I use 15-pound Sabertooth braid as my main line and eight-pound fluorocarbon for my leader. When using sacks or shrimp I’ll place them on a size eight hook. I’m running both on 8.5 to 10.5 gram Redwing Tackle floats. 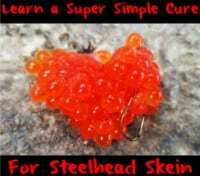 Come prepared with several colors of different baits and you can expect to have a good day.